It is Dad’s Day soon and that means we’re firing up the grill and grabbing the barbecue sauce for an all day, man appreciating, grilling bonanza! 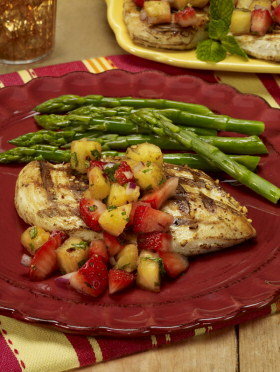 We’re starting with some grilled chicken with fruit salsa, a recipe I adapted from Mass Live, before heading into our finger-licking ribs from DroolWorthy for the main course. And finishing off with some yummy fruit dessert, all courtesy of a dad favorite, the grill. Preheat the grill on medium high, and brush the grill rack with oil. Once the rack is hot, cook the pineapples on each side for about two minutes before letting them cool and chopping them up. In a medium sized bowl, stir in your pineapples with the remaining salsa ingredients, except for the lemon, which you’ll first grate and then add about a teaspoon of the zest into the fruit mixture. Then, sprinkle both sides of the chicken with seasoning and salt before adding them onto the grill. Grill for five minutes on each side until completely cooked through. After adding the chicken and salsa onto a plate, squeeze the lemon on top and enjoy! Four to eight hours before grilling, (I usually put mine together in the morning) mix together your Worcestershire, soy sauce and ½ tablespoon of Sriracha in a bowl. Next, mix together your dry rub: salt, garlic powder, black pepper, brown sugar, chili powder, and ginger in a separate bowl. First add on the dry rub and then the apply the wet rub mixture. Preheat your grill to 350 degrees, and once it’s all ready, cook the ribs for an hour and fifteen minute over an indirect heat. After, remove the ribs from the grill and place them into a foil pan along with the onions. Cover the ribs with honey and beer, then place foil on top of the pan. Reduce the grill heat to 325 degrees and add the rib pan back onto the grill for another hour and fifteen minutes. Remove the ribs from the grill again. Combine ½ tablespoon of Sriracha, barbecue sauce and drippings from the pan. Place the ribs back on the grill (no longer in the pan) and baste with sriracha-barbecue sauce. Cook for an additional twenty minutes, or until ribs are black and crispy. We also grilled large slices of zucchini, butternut squash, and sweet potatoes for sides. I turned them on the grill like the pineapples, and sprinkled salt and pepper on for taste. Chop the fruit into large slices and oil the grill again. Cook the fruit slices on each side for about two minutes. When the fruit is cool, chop them all up, and place them into the serving bowls with yogurt on top! Have a fantastic Father’s Day with the special men in your life, and let us know how your BBQ dishes turn out in the comments below!